Today is the last day of the event in Barcelona and we’ve thought that all devices have been caught by the cameras, but it looks that we’ve been wrong. GIGA-BYTE officially introduced two models of its new line, which we've already seen and examined. However, another phone has been hiding in the shadows. 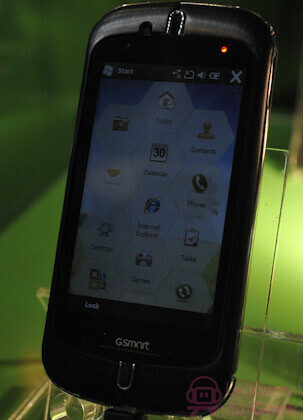 The GSmart S1204 incorporates the new design language of the manufacturer that can be found also in the S1200. Again, it features a 3.1-inch touch-sensitive screen, GPS and is rather thin (12.1 mm), but packs also an 8-megapixel camera, more powerful battery and TV-out. What’s more interesting is that the leaflet with the specifications says that it will be using the new interface of the manufacturer, Smart Zone. On the pictures, though, you can easily notice Windows Mobile 6.5’s home screen, which makes us think that this handset is scheduled for this autumn.